A new dinosaur species discovered in China is being called "extreme"--and for good reason. The dino's neck is so long that it makes up more than half of the creature's huge 49-foot-long body. The dinosaur--dubbed Qijianglong guokr, or "dragon of Qijiang"--is believed to have roamed Asia about 160 million years ago in the Late Jurassic Period. It was identified by skull and vertebrae fossils unearthed in 2006 by construction workers near Quiang City in the southern part of the country. "If you imagine a big animal that is half neck, you can see that evolution can do quite extraordinary things," Tetsuto Miyashita, a Ph.D. student at the University of Alberta in Canada and a member of the team of scientists who identified the dinosaur, said in a written statement. “Qijianglong shows that long-necked dinosaurs diversified in unique ways in Asia during Jurassic times—something very special was going on in that continent." 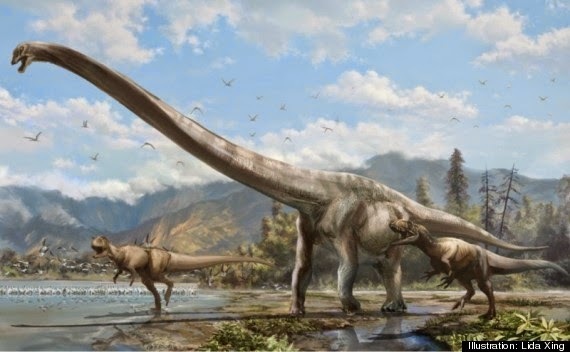 Qijianglong is believed to belong to mamenchisauridae, a family of dinosaurs known for extremely long necks. But unlike most mamenchisaurids, Qijianglong had vertebrae that were hollow and so tightly linked that the dinosaur's neck is believed to have been stiff like a construction crane. A paper describing the newly identified dinosaur was published online in the Journal of Vertebrate Paleontology on Jan. 26, 2015.